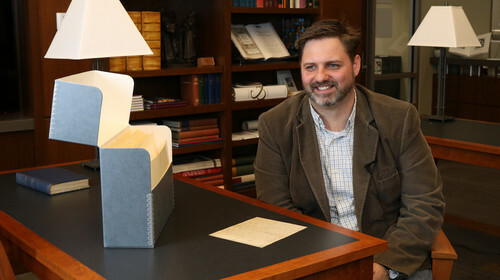 I am the curator of archives and manuscripts at Pitts Theology Library, Emory University. Pitts Library supports the academic activities of Candler School of Theology, as well as the Graduate Division of Religion and other departments on Emory's campus. In special collections, we primarily collect materials related to the Christian tradition, but other religious traditions are represented as well. As the curator of archives and manuscripts, I oversee our archives and manuscripts department and manage the special collections space. I also head up our digitization efforts and serve on the university's digital collections steering committee. When I was an undergraduate, my boss collected antiquarian books. After I expressed some interest in the "old books" he flew me and my wife, Wendy, to San Francisco to visit the 2005 California International Antiquarian Book Fair. The book fair was an amazing experience and was really the impetus of my interest in rare books and manuscripts. The highlight, for me, was seeing the 1516 edition of Erasmus's Greek New Testament on display. I went home from the fair with a nice vellum bound edition of Horace's poetry and a manuscript letter written by Bishop Lightfoot. That's how I became initially interested, but I took a detour in my first few jobs in academic libraries, which centered more on public services. It wasn't until I started my current position in 2015 that I was able to work with rare books and manuscripts on a regular basis. I came into my current position as a subject specialist; in other words, I didn't have an MLIS degree or formal training in archives. Instead, I hold a Master of Theological Studies as well as a PhD in religion from Emory University. My dissertation looked at how the author of the book of Acts in the New Testament uses ancient rhetorical strategy to characterize the Apostle Paul in his speeches. At Pitts Theology Library, we have a very strong collection of Wesleyana--materials related to John and Charles Wesley, the founders of Methodism. We have hundreds of manuscripts related to the Wesleys but one in particular stands out as my favorite: John Wesley's diary from 1736. Wesley wrote in this diary during his brief but significant sojourn in the nascent colony of Savannah. Here he details his daily activities while writing in a coded shorthand. Wesley's ministry in Georgia was ultimately unsuccessful, partly stemming from a failed relationship with a woman named Sophia Hopkey, but his experiences there helped shape his later ministry and what would eventually become the Methodist church. Thus, the diary is certainly one of those pieces that generates a strong reaction from people and in my opinion was the gem of our recent exhibition called Religion of the Heart: John Wesley and the Legacy of Methodism in America. I don't actively collect rare books for myself. I have a few that I've purchased or have been given, including some beautiful publishers' bindings or association copies. In terms of book collecting, I've really spent a considerable amount of effort on building a robust academic library of biblical studies and related books. I am particularly interested in the history of scholarship and so I tend to focus on books that have shaped the discipline. But, because I have limited space for books, the collection has maintained a steady size of roughly 1,200 volumes. Also, now that I work at a theological library, there seems like less of a need to grow the collection. I'm a father of two young kids (ages 5 and 2) and so that keeps me busy much of the afternoons and weekends. When I do find time I try to spend it in my workshop building furniture or other things made from wood. I actually find woodworking, especially using hand tools, very therapeutic, and so if I weren't a librarian, I'd probably build stuff for a living. I'm interested in the stories that books tell--that is, the information gleaned from the book as an artifact. A book from the fifteenth or early sixteenth century shows us how manuscripts transitioned into the printed form, how the typesetter had to figure out new solutions to present text in multiple registers or unique ways. For instance, we have a 1503 edition of Rabanus Maurus's De laudibus sanctae cruces, in which the printed form beautifully mimics the figurine drawings and letter arrangement of the manuscript poems. Google Rabanus Maurus's work and you'll get a sense of what I'm talking about. I love researching the provenance of books and investigating clues on how particular books were used by their former owners, such as their use of manicules and marginal notes. A good percentage of the books in our Special Collections are Sammelbände (or bound-withs), which tell us a lot about how certain books were associated with other books by their owners. I'm fascinated by any sort of observable data that connects us to and sheds light on the previous owners of the books. Sharing this with students, that is, these connections to people of the past, is a very rewarding experience. As academic libraries tend to collect the same circulating books or subscribe to the same databases, it is often special collections departments that distinguish one library from the next. With that in mind, I think there will be a continued rise in the interest of special collections. One of the areas that I'm really excited about is taking digitized collections beyond simply making them publicly accessible. At Pitts Library, we have a few interesting projects in the pipeline, such as collaborating with other institutions to reunite similar collections or separated manuscript leaves. Our library has also been working with the Emory Center for Digital Scholarship to enhance the discoverability of our collections through adding additional media types to digitized collections (e.g., adding searchable text to an audiovisual collection), or to produce online critical editions of works in our collections, and to present content in new and meaningful ways. Any unusual or interesting collection at your library you'd like to draw our attention to? We recently had an inscription in a book identified as a previously unknown autograph of Martin Luther. The book, part of our Richard C. Kessler Reformation Collection, was written under a pseudonym and there was uncertainty about the identify of the author. Yet a three-line inscription written by Luther puts to rest any uncertainty and identifies the author as Johannes Petzenstein. The timing couldn't have been better. Ulrich Bubenheimer, the scholar who identified the writing as Luther's, made this discovery about one month before the 500th anniversary of Martin Luther's 95 Theses. We have a fairly vigorous exhibition program at Pitts Theology Library and typically have three major exhibitions each year. In August we'll install a new exhibition called Looking Back - Looking Forward: Reading at the Reformation through the Lens of Contemporary Christianity. Following that, we'll have an exhibition featuring Emory's collections of Illuminated manuscripts and incunabula. Then, after that, we'll have an exhibition on the histories and traditions of the Bible in English. For more on our exhibitions, see this page.